Rebekah takes Hayley to the plantation house and she begs, not really, for permission to throw a kegger. Elijah goes to Sabine the witch who happens to be Celeste, how does he not know it’s her? He asks for her help and he finds out that the witches are anti-Klaus, Celeste tells him that maybe they can come up with a happy-medium solution since she knows that he has a niece on the way. Now Cami and Klaus are together and they are talking when she takes the blade in her hand but instead of stabbing Klaus she tells him about the witch and gives it to him. She says that if there is a war, she wants to be on the winning side. 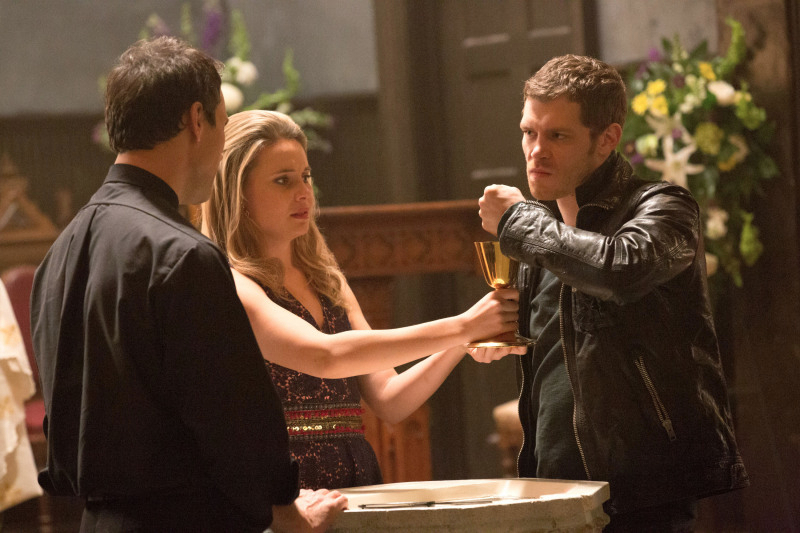 So Klaus tells her that they will help Father Kieran. What they have to do now, drain him of some of his blood so that Klaus can compel him and save him. Back at the plantation, Hayley finds herself with another wolf and um…so does Rebekah. With a blond, naked man in the house, Rebekah gets a little red and flustered. The party rages and she’s dancing the night away with the cutie. Hayley meets Jackson, the wolf who has been watching her. She thinks that he is watching after the baby but his interest is in her, apparently they are of the same people, their parents knew each other and their part in the wolf family was that she was supposed to be his wife! Marcel on the other hand is with Sophie and Monique trying to find a way to get Davina back, find the witches and find out what the heck is going on. Elijah and Sabine are out on the town and all of a sudden he calls her Celeste! She asks how does he know? He goes on to explain himself, the first time she met him again, the acts that she has taken to prevent the Harvest. She gets in close and kisses him, he reciprocates. She calls him her lost love and that after all this time doesn’t he understand, Klaus killed her and now she is here to teach him the error of his ways and bam she puts a trance on him! 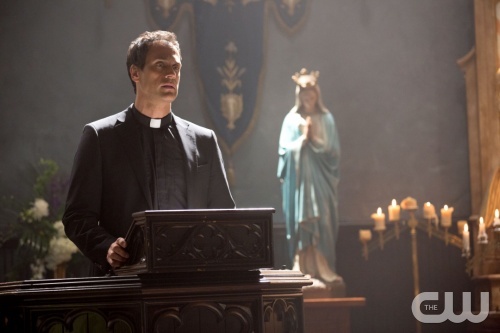 Father Kieran now is being compelled by Klaus who tells him that he will overcome and resist the witches. 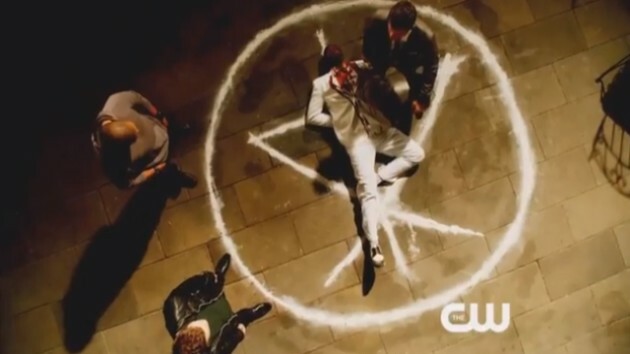 But it looks like it might not have worked and angered Klaus says that he is going to find the witch who did this and do what he does best…kill them. Now Sophie and Marcel are working on a locator spell when Klaus interrupts and takes Monique. Elijah, under Celeste’s power is weak, she tells him that he is going after Klaus, that poor Rebekah will be in a predicament and that Hayley will also be in harm. She weakens him and now he will only have the power to save one person, will it be dear brother Klaus, sister Rebekah, or lover Hayley and the baby? The evil B! Klaus is on a rage when he threatens to kill Monique with the blade if the witches don’t show up. Marcel says that they do not kill children and fights him, the blade falls to the ground, he twist’s Marcel’s neck making him unconscious and then Sophie arrives and stabs the powerful blade that will cause immense pain to an Original into Klaus who growls and then falls to the ground. The witch who hexed Father Kieran shows up and tells Sophie that she will take it from here! OMG too much going on right now. Leave The Originals alone!! Jackson and Hayley keep talking about The Crescent wolf line, hers and his. He tells her about how they were royalty and back in the day the wolf owned New Orleans, the vampires came in and took over. Marcel made the witches put a curse on the wolves and how things were all different. Jackson says that he was told that her witch friend that today was the day that Hayley would lift the curse off of them, she asks what witch friend and we go to Rebekah and the blond guy making out. He stops and tells her this is the deal they made and now she is surrounded by wolves. The witches are brewing up a storm, Elijah wakes up and gets a call from Hayley who tells her that they are in trouble. He tells her to find Rebekah but they are trapped inside. Now it’s up to Elijah to save one or risk losing them all. The witches spell is strong and Celeste is seeking vengeance. Jackson tries to help but it’s no use. Elijah smashes into the house and saves Hayley but asks where Rebekah is. Jackson is stuck inside until Elijah goes back in and save him. Rebekah, bloody and hurt lies on the ground when a witch comes up to her and we know this is not going to end well. Elijah walks into the bayou and runs into Celeste who tells him that Rebekah is with a witch and Klaus is suffering immensely. She continues to hurt him and says I guess their love is not forever and always. Hayley tells Jackson that she will find a way to break the wolves curse. Cami runs into the witch who cursed her uncle and tells her that he will still die, she went back on her word and now she has sided with evil and the curse will reign. Elijah is infuriated! While he chose to save Hayley, his brother and sister are in danger. He goes back to the house and tells Marcel that everyone will be on the look out for them and he will kill every single one of the witches. You go Elijah! Now Sophie wants to run from New Orleans since she just stabbed an Original and knows that danger is ahead of her. She takes Monique but then Monique turns on her and kill her telling her she is a non-believer since she is trying to run away from the witches. Monique tells her that she is staying and that when the Harvest is complete the four girls will have enough power to run the city and they can kill anyone who gets in their way. What a heart racing episode! Tune in next week to see what becomes of Klaus and Rebekah and how Celeste tries to run the city.